If there’s one thing that Sydney has in overwhelming abundance, it’s Asian food. And, we’ll be real with you—we love it all equally. Whether it’s sweet miso everything (but particularly eggplant), steaming bowls of pho, or many of the weird and wacky desserts, Asian food is definitely one of our great loves. This list could go for days, but here are our top 50 Asian things you absolutely should have tried if you live in Sydney. 1. The eggplant in secret sauce at Old Street Chinese is second to none (order two, but share). 2. Head to Emperor’s Garden Cakes and Bakery for the Emperor Puffs, then thank us later. 3. As wobbly (and delicious) as they sound, the limited edition Japanese soufflé pancakes at Harajuku Gyoza are a must. 4. Gelato-filled buns are a thing at Jarern Chai Boon Café and that’s #enoughsaid. 5. Matcha errrrythang is on our list and the matcha anmitsu from Chanoma Café absolutely makes the cut. 6. If you haven’t tried the popcorn shrimp from Saké, then have you even really lived? 7. Or the sashimi platter from Tokyo Laundry, while you’re at it. 8. The grilled chicken at Hai Au is charred in a banana leaf and is the epitome of simple things done well. 9. Ice stream ramen from Dessert Kitchen blew up in New York and Melbourne, and now it’s in Sydney. You know what to do. 10. 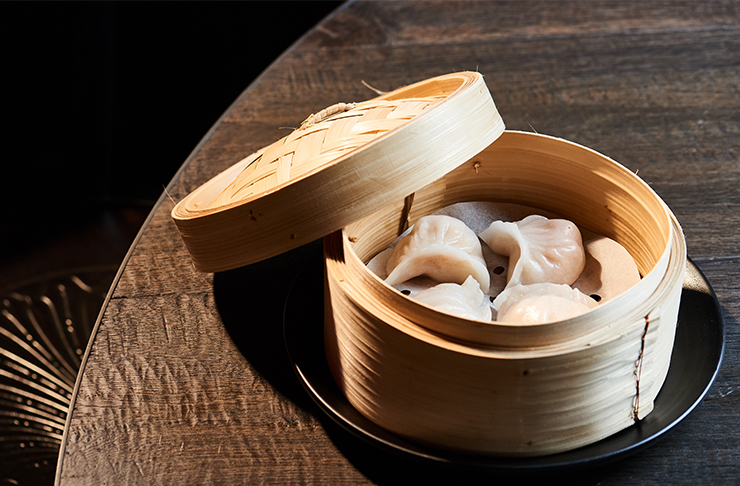 The Classics never go out of style and neither will the prawn and water chestnut dumplings at China Diner. 11. The stuffed eggplant is damn delicious at Ashfield’s Golden Times Chinese Restaurant. 12. You wouldn’t order anything but the pho at An Restaurant in Bankstown. 13. But we absolutely recommend the steaming bowl of broth and rice noodles at Pho Pasteur as well. 15. Taro snow flakes from LNC Dessert House is the prettiest dessert you’ll eat all year. 16. Known for their specialty street food dishes, order the bánh xèo and bánh cuốn at THY. 17. The guys down at Great Aunty Three make a mean banh mi. 18. With two outposts—in Marrickville and Cabramatta—Bau Truong pays homage to the lesser-known Vietnamese noodle soup, bún mắm. 19. The coconut sago from China Lane is packed with sticky black rice and topped with juicy, juicy mangoes. It’s basically a tropical holiday in a bowl. 20. Golden Century is where Sydney’s best chefs go when they clock off and we know why—it’s some of the best Chinese food in Sydney. Order the stir fried mixed bits. 21. With a shop in Newtown and another in Cabramatta, Thanh Binh is Dan Hong’s original stomping ground and we just want the rice paper roll kit (and the spicy pork balls). 22. 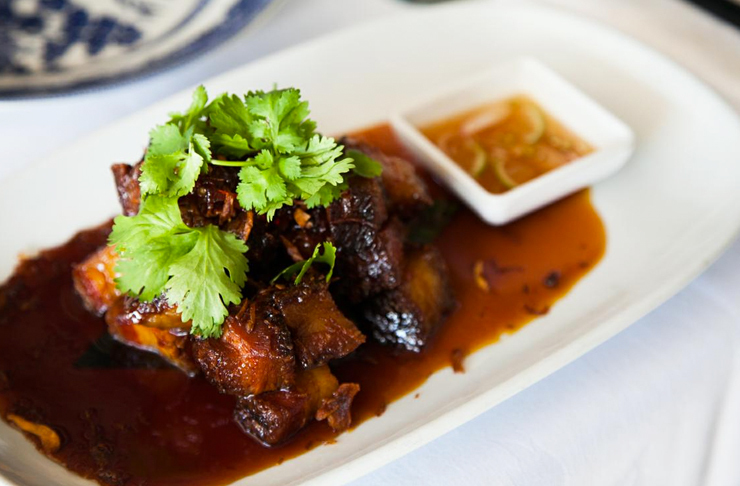 The pork belly at China Doll is just the right amount of sweet. 23. Go all out with the tea-smoked ½ duck with mandarin pancakes at Spice Temple. 24. It’s all in the name at Se Jong Korean BBQ Buffet (get it?). 25. You might be surprised to hear that The Dynasty is hiding in Canterbury RSL and you’ll want the har gau (steamed prawn dumplings) from here. 26. We’d be happy with three of the crispy pastry egg custards from East Phoenix right about now. 27. Same goes for the pad Thai at street style tuck shop, Muum Maam. 28. Anything from the sushi menu or off the robata grill at TOKO is a yes. 29. Smack bang in the middle of Chinatown, order anything from Marigold. We do mean ANYTHING. 30. Family run for the last 20-odd years, Pho Tau Bay is all about the big ol’ bowls of pho. 31. A Chinatown institution for a reason, the yum cha at East Ocean is a big fat yes from us. 32. It be exxy at King Fook (because feasting is mandatory), but the ham sui gok (fried glutinous rice dumplings) are worth it. 33. Mr Wong is a officially a CBD classic and the prawn toast with foie gras and almonds are just the beginning. 34. The mmmmmatcha from Koi Dessert Bar is a MasterChef grade dessert (obvs). 35. If you’ve been looking for a reason to try the chicken feet at Palace Chinese, this is it. 36. 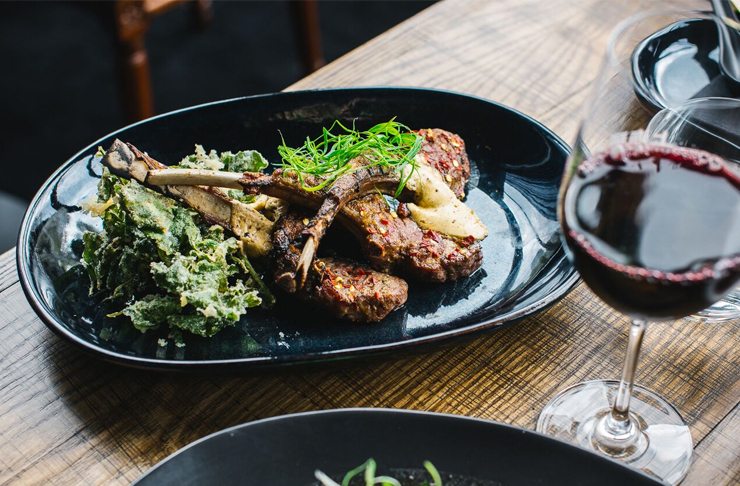 Lamb cutlets in miso butter are happening at Madame Shanghai and that’s all you need to know. Really. 37. The degustation at Tetsuya’s is legendary (for a reason). 38. Baby capsicum poppers from Sokyo are even more fun than they sound. 39. Thai fine dining at its best, Long Chim is alllll about the soft shell crab stir-fry (for starters). 40. The pandan waffles at Green Peppercorn are the sweet treats you need right now. 41. Now with two outposts, the coconut-doused corn cob at Sugarcane is proof that simple is often best. 42. There are many great things at Golden Lotus but TBH, all we need is their young coconut juice. 43. Unexpectedly amazing, the filled eggnet at Longrain gets us every time. 44. Jumak’s beef bibimbap is an absolute must. 46. 678 is THE king of the banchan and it’s all about the side dishes here. 47. You could keep it traditional at Ms. G’s, oorrrr you could order the cheeseburger spring rolls. 48. The cheesecake from Uncle Tetsu’s is a goddamn classic. 49. Settle in with the BBQ pork belly, broccolini, turnip and wakame at Moon Park. 50. Billy Kwong mixed classic Asian fare with native Australian produce. Exhibit A is the steamed vegetable and warrigal greens dumplings. If you're only interested in Sydney's best Asian desserts, read this.